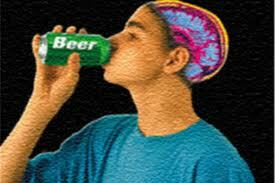 If beer made you smarter there’d be a lot more geniuses among us. A new study, published in the Journal of Neuroscience and conducted by Neurobiologist Hitoshi Morikawa of the Waggoner Center for Alcohol and Addiction Research at The University of Texas, apparently shows that though traditional views of alcohol and memory still hold true, drinking can prime other parts of the brain for a different type of learning. Subconscious. The effect is attributed to the release of dopamine in the study. According to Morikawa, though the chemical is often known for making people ‘happy,’ it also plays a large role in subconscious learning. Perhaps more importantly, the study suggests that alcoholics may not be addicted to the pleasure derived from alcohol, but the cues that are reinforced with the release of dopamine. In turn, the study suggests that alcoholism is a subconscious learned behavior as alcohol makes it easier to become a consistent behavior. It’s kind of a self-fulfilling cycle, and according to the study creates drug-related learning patterns.